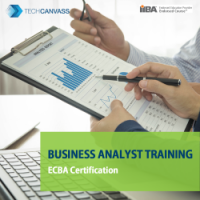 IIBA ECBA Certification is the most respected business analysis certification for entry level business analysts. Getting this certification needs thorough study of the business analysis body of knowledge (BABOK) guide, published by International Institute of business analysis (IIBA), Canada. This ECBA study guide has been written for every ECBA aspirant who would like to have shortened and summarized version of BABOK with experts notes for better understanding. The book was not an alternative to BABOK guide but a revision guide, which will help in quick and meaningful revision of BABOK v3. Help you revise BABOK knowledge areas and techniques quickly. It is a concise version of BABOK. Help you validate your understanding of BABOK with the help of quizzes and exercises. You can download the sample chapter of the book from the Techcanvass website by visiting the ECBA Study Guide PDF download page.